In July the audience of the Russian animated film festival will have a chance to watch Polish films. Insomnia Animated Film Festival is the first Russian non-commercial animated film festival in the open air. The fifth edition of the festival is held this year from the 13th to the 17th of July, in the area of Kaluga (Russia). "Impossible Figures and Other Stories II" by Marta Pajek, made in Animoon studio, is the image of the world full of paradoxes and illusions, based on the concept of the impossible object. Piotr Loc Hoang Ngoc in "Gyros Dance" tells a tale about the employees of a kebab restaurant. 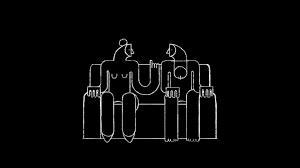 "Beside oneself" by Karolina Specht is a minimalist, black-and-white animated film, which shows how deceptive the process of replacing the reality with illusion and imaginations can be. Marta Magnuska in "Foreign Body" presents a story about things, which seem strange and weird, but in reality, they are close to us - about the internal and external transformation. "O Mother!" by Paulina Ziółkowska is an extremely visually attractive story about a peculiar relationship between mother and son.